Military Style Tag Military Style Pet ID Tag  - $7.00 : Your Pet Store, Made in the USA! 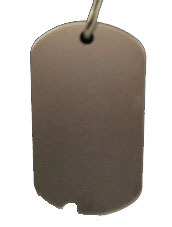 This is a tag in the shape of a military dog tag and is available in different colors. The picture of the tag is the actual size of the tag. The measurements of the tag are 1" wide and 2" tall. This tag is appropriate for dogs over 20 lbs. The gold color is solid brass, and is the most durable material for a pet tag. The red, blue, purple, black, and silver are made of aluminum, and are lighter weight than the brass tag. The printing on the tag is stamped in, so no matter which material it is printed on, the printing will stay visible. The aluminum tags do not last as long as the brass on large pets or very active pets. However, if your pet is small or not very active, the aluminum tag is a better choice.